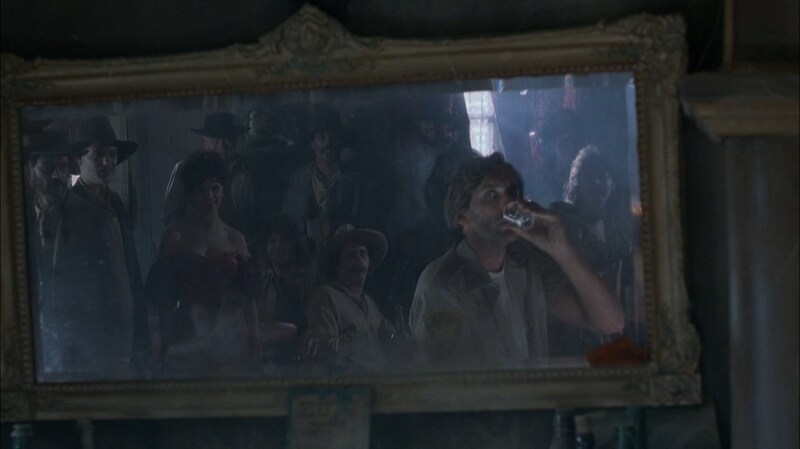 GHOST TOWN: A Quick Visit To The Spooky Sagebrush – Schlockmania! The horror film and the western make a surprisingly good combo. It’s not a genre-blend that’s used too often – spaghetti western filmmakers are probably the ones who used it the most – but a well-calibrated blend of the two styles can give you a classic like High Plains Drifter. The latter film was probably an inspiration for the makers of Ghost Town, an overlooked Empire Films production that represents a fun b-movie version of a horror/western crossover. The results have the occasional rough patch but show what a distinctive combo these two genres can create. Ghost Town begins with wealthy ne’er-do-well Kate (Catherine Hickland) speeding out of town and running into a mysterious dust-storm that consumes her. A deputy named Langley goes look for her in the desert and gets pulled into the same mysterious circumstances, finding himself stranded in an Old West town where Kate has been kidnapped by Devlin (Jimmie Skaggs), an outlaw who has the unique characteristic of being undead. As Langley tries to rescue Kate, he discovers that the town has a terrible secret that resulted in its cursed, supernatural state… and getting out of this metaphysical trap will be a supreme challenge. Ghost Town shapes up as a decent programmer for a few reasons. From the beginning, it works nicely as a mood piece that effectively exploits a great western town set and sleek, prowling cinematography by Mac Ahlberg. Duke Sandefur’s script, adapted from a story by David Schmoeller, has fun with bending reality a la Wes Craven and mixes horror and western elements to stylish effect. That said, it borrows a little too heavily from High Plains Drifter for its big late-in-the-story plot reveals and the rules of how the town’s supernatural status works are never fully explained or explored. The film also feels a little rushed in its third act, which might reflect the behind-the-scenes chaos rumored on this project (it’s been said that Ahlberg finished the film after the director walked). That said, Ghost Town gets by on creativity and energy. Luz, who was also in the underrated The Nest, makes a solid, relatable lead and is backed up nicely by an ace supporting cast that includes Bruce Glover as a blind card dealer and Michael Allredge as the good ol’ boy sheriff in the present-day part of the plot. 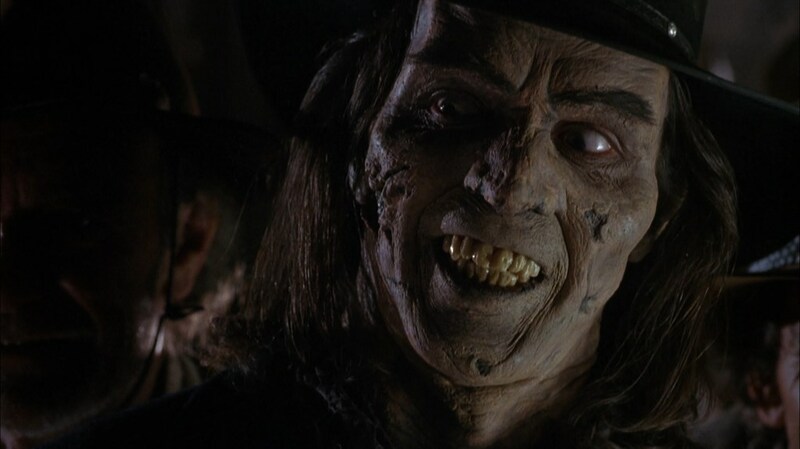 Skaggs makes a fine over-the-top villain and gets the most out of the zombie-style prosthetic makeup designed by John Buechler. The results deliver a nice blend of mood, periodic shocks and shoot ’em up action throughout and gets it all done in 85 minutes. In short, Ghost Town is a fun, quick riff on the horror western that makes up for its lapses in substance with plenty of style and energy. It’s worth adding to any survey of the Empire Films catalog. 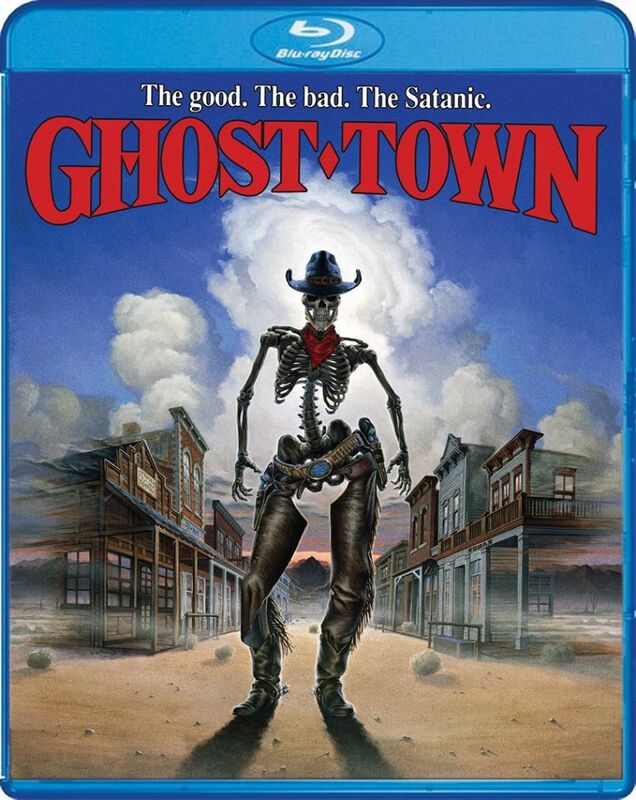 Blu-Ray Notes: Ghost Town will be released on blu-ray by Scream Factory on July 28th. The transfer looks pretty nice, with rich colors and decent if not mind-blowing detail. Given that this title never made it to DVD, fans will be happy to see this considerable upgrade from the old VHS version. The 2.0 lossless stereo sound offers a robust and well-balanced blend of sounds. There are no extras.